I'm spellbound whenever I watch Swing Time (1936) and see an absolutely stunning, peak-of-her-beauty-and-popularity Ginger Rogers in that marvelous Never Gonna Dance opus, and wearing that dress--the white one--you know the one I mean. Maybe it's the beauty of the song (Fred's brilliant vocal), the way Ginger moves--she had quite a figure, didn't she? Oh, the beauty! Perhaps it's the way she gave herself to that performance--Rogers was involved in an affair with Swing Time director George Stevens-- but for me, this dress symbolizes the elegance, class, sophistication, and everything else Hollywood had on the ball in the 1930s. She is spectacular. As is the dress. One of my favorite films. I had no idea Rogers had an affair with George Stevens. Swing Time is a beautiful film. Stunning outfits, graceful dancing, and wonderful music. I too, think that she is absolutely gorgeous in Swingtime! That dress is definitely up there as one of my favorite movie costumes. I must admit, I have never watched 'Swing Time' (gasp). But...seeing the photo, I wonder how Ginger's dress would do in a showdown with Joan Crawford's famous frock from Letty Lynton?! Fantastic picture! That's one of my favorite Fred/Ginger dances. Really wonderful blog, C.K. Dexter Haven! How about linking to each other? If you find my blog worthy, of course! She is so incredible. I love that pic. This promo photo still was not only promoting the movie "Swing Time" plus a newly synthetic fabric. The actual color of the fabric was "pink" which was Miss Rogers favorite color. An eBay seller from Australia sold a vintage 8 by 10 copy of this photo for $2,242.00 USD last summer (2008). The vintage newswire promo photo had copy of the news article taped to the back which provided provenance info sited earlier. I was not the winning bidder by a long shot for the record. C.K. - I am so happy to see that you posted this photograph as I have not see this one before. And, it is the best of those I have seen, by far. Do you have others of it you could post? I am trying to have this dress made for my wife as a Christmas surprise (she has Ginger's figure and stage presence). This is the most beautiful gown and cape I have seen in a Hollywood film of any era. Ginger was fantastic in it and the Never Gonna Dance sequence is our favorite of all of Fred and Ginger's dances. I wanted to ask you and the poster "Benny" above, what is the source for the color being light pink? That surprised me. Is that a "for certain" fact and if so where is the resource providing it? I have a very talented friend who is a costume designer and directs/chairs the theater department at a leading university who advised me it was likely very pale blue. He suggested that color as likely because light blue photographed whiter in black and white than white itself. (He may make the dress for me if he can find the time. He makes all his wife's gowns and they are amazing.) I presume a faint pink does as well as light blue then? I also wanted to ask you and any readers about exact material and the weight of the fabric that was actually used (for certain)? I have not been able to locate a pattern or material information either one. We can guess, but it would be nice to know. Great blog you have here; quite sophisticated! You are an excellent writer! Thanks again. Yup, still in love with that dress! 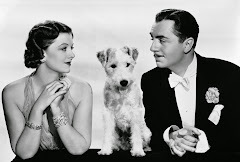 I think in a way Swing Time for Ginger was like Meet Me In St. Louis was for Judy Garland in the way that Judy felt so secure and taken care of under the direction of Vincente Minelli that she came off looking gorgeous. Ginger had just come off a string of movies with Mark Sandrich and in Swing Time she got to work with George Stevens who really cared about her and wanted her to look good. I just watched "Swingtime" and boy, oh boy that dress. *Sigh* Does anyone know who designed it? Or any of her gorgeous dresses? I'm guessing she had two dresses for "the dress" in "Never Gonna Dance". One satin cling one for the scenes before the dance number. Another for the actual dance itself. If you look closely at the picture above it shows lots of tight pleats sewn down which would give the lower part of the dress the big circle affect when she dances. The top part would be a very light silk, maybe? I'm just guessing, though. Oops. Guess it's "Swing Time" not "Swingtime". Sorry. I wondered if the dress still existed somewhere, hence the Google search that brought me here. It would seem that if so many of us recognize now how outstanding that dress was for her, it would have been obvious back then, too. It's Ginger's birthday today and I've spent it watching TCM since midnight. It was nothing but Ginger and Fred up until about 2PM today. Thanks for posting. I have now had THE DRESS copied for my wife, after considerable research. The original exists but is in a private collection, undisplayed. It was last seen in NYC at the MMoA in a special gown show in the late 70's. It was silk georgette, two layers of fabric, forming two big circles. The material was cut on the bias. The dress was constructed in 22 panels with French seams, every other seam (in the skirt part only) held hand applied sequins. It had an under-structure similar to a 1920's bathing suit--with those short-short style legs. The original also had weights in the hem that were the size of half 50 cent pieces and made of something similar to a clear plastic. It was originally light pink and George Newman, RKO's costume director designed the gown. He surprised Ginger by doing it in her favorite color and she wrote in her book that she was greatly pleased. I had the dress copied in aqua for my wife as that is her favorite color. Those colors would have looked the same in black and white film. It took my seamstresses 85 hours to make the dress. My wife has worn the dress twice, first in LA at an Academy Awards party and later to a black tie benefit here at The Greenbrier Resort. It is not an exaggeration to say that this dress is dazzling to the eye. She has never received such complimentary comment. I removed the earlier post which I deleted here and have placed it where it more properly belonged, with the continuation of this thread on Hollywood Dreamland. That section is titled THE Dress Revisited. Jerry Lewis: It's About Time!